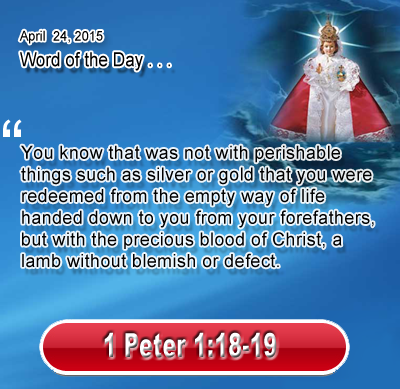 Heavenly Father, may we live each day more aware of our inestimable value to you. May our words, thoughts and actions be permeated with your sense of my worth - not so that we may seem important to others, but so that we may live in holiness and honor to your precious gift to us. Through him we pray. Amen. Holy Spirit, be teacher and guide. Open our ears to hear God's word and open our eyes to understand God's action in our life. May our heart never grow dull and may our ears never tire of listening to the voice of Christ. Amen.